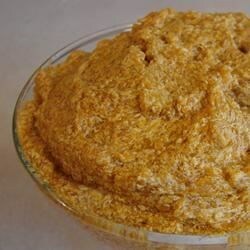 "A smooth, easy to make spread that's great on hot rolls." In a medium bowl, using an electric mixer, beat margarine for 30 seconds, or until creamy. Gradually blend in the pumpkin, confectioners' sugar, cinnamon and nutmeg. Cover and chill overnight. Let stand at room temperature for 30 minutes for easier spreading. I didn't like the way this mixed up. It didn't seem smooth enough. It tasted okay, but the look and texture left a lot to be desired. The taste of this butter is okay but it does not look appetizing. It seemed to curdle. My coworkers wouldn't even try it due to the appearance. I was disappointed by this recipe. I was expecting a more flavourful and sweeter "honey butter" type spread but this didn't seem to have much of a taste at all unfortunately. Simple to make, yummy on fresh bread or pumpkin muffins. Could use some more spices. Had a lovely pumpkin flavor.